You would think that outrageous myths of the dark ages of mankind would be long consigned to some dusty books in library archives. You would think. Most recently, a Saudi cleric repeats a charge that any educated, intelligent person would be expected to dismiss out of hand as nonsense. The trouble is, apparently not everyone is educated and/or intelligent. By the millions, anti-Semites from around the world not only believe the charge, they slaughter any Jew within reach in revenge for their ‘crimes’. 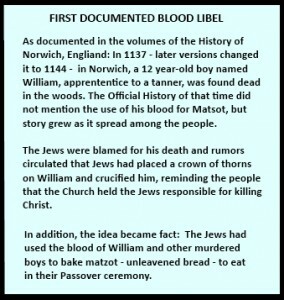 The vicious charge (blood libel) was first raised against the Jews in the year 1144. Jews were accused of murdering Christian children, draining their blood and using it in the Passover Matzot (unleavened bread). In those days ‘news’ traveled from person to person, growing with transmission, often inciting mobs. There was no way to verify the story and sometimes the more extreme the news, the faster it traveled. Over the centuries that followed, the charge was renewed and thousands of innocent Jews died all over Europe. That Jews who are forbidden to eat even of the blood of an animal slaughtered for food, makes this claim absurd. That doesn’t keep it from being repeated endlessly in anti-Semitic propaganda around the world, especially now among the Muslim Arab populations. Unfortunately, even today we see over and over the power of unverified and even purposefully started rumors among Arab populations. Even if ‘proven’ untrue, most of the people will believe that there was truth in it and mob violence, intended or not, is the result. Nothing can rationally explain the extreme Christian accusations leveled against the Jews at this time: Jews killed babies and drank their blood! …the most famous of all blood libel legends is that of the ritual murder of the child Hugh of Lincoln, England in 1255. The story was immortalized in a ballad so well-known in England and Scotland that is number 155 in the standard cannon of English and Scottish ballads compiled by Francis James Child in the 19th century. The best-know tale of ritual murder is the Prioress’s Tale, found in Chaucer’s 14th century classic work or early English fiction, Canterbury Tales. Jews suffered from hemorrhoids as a punishment for killing Jesus and drinking blood was the best cure for hemorrhoids at the time. All Jewish men menstruate and need a monthly blood transfusion. Jewish men, when they’re circumcised, lose so much blood because of that surgical procedure that they need to drink Christian babies’ blood. It’s the chief ingredient in matzah, and therefore prior to every Passover Jews would be requiring a large supply. What do you think the correct answer is? Shockingly, it’s (5)—all of the above. Today, we are less likely to face mobs with pitchforks and torches. We are more likely to face car bombs, terror attacks, missiles, chemical weapons, atomic weapons and whatever the enemy can find that will annihilate the most people in the most efficient manner. The myth is absolutely outside the range of reality. It is the product of an ancient rumor mill, a tale given life by people ignorant of the Jews and their beliefs. The story was never an accurate description of an actual event. But the murder of every Jew who has ever died or will ever die because of it is actual and that’s a terrible price to pay for a myth. Now, in propagating this myth, the Saudi cleric and others like him may indeed be igniting a regional fire that will become a nuclear war – World War III. Some jews eat bacon … that is against the rules … what about usury ? Lame article.